Microsoft’s answer to Siri and Google Now surfaced earlier this year as Cortana. The virtual assistant is already available on Windows Phone devices and is all but guaranteed to show up in Windows 10 – we just haven’t see any hard evident of it yet… that is, until now. 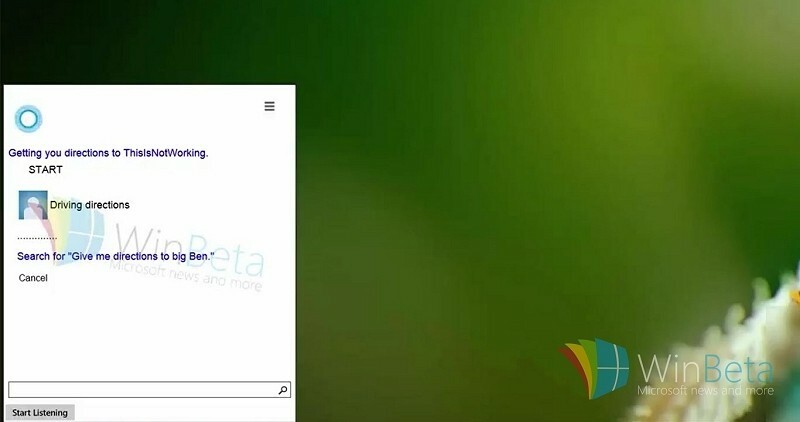 WinBeta managed to get access to a version of Windows 10 with Cortana. It’s worth pointing out that this is an early, pre-release version meaning the final product will look much more polished than it does in the clip below. The Cortana experience in Windows 10 will pretty much mirror what’s already available on mobile. For example, users will be able to search maps and get traffic information, set reminders, call people via Skype, control music playback and check the weather, among other things. As you can see, Cortana doesn’t yet have a “personality” in this early build so you can’t ask it personal questions like “Who are you?” and so forth. This functionality is expected to come baked into the final consumer version, however. One unknown at this hour is whether or not Windows 10 users will be able to activate Cortana hands-free. Such ability would of course be convenient but we’ll have to wait to see what Microsoft has in store next year. Microsoft launched a Technical Preview of Windows 10 a few months ago for enthusiasts to check out. A consumer-friendly preview of the OS is expected in early 2015 followed by the actual product launch in late summer or early fall.